Shop our online store to choose from 15 varieties of garlic for fall planting. Plant your garlic between September 15 and November 30, depending on where you live. The optimum planting time is after the first light frost. Garlic is a heavy feeder and likes loose, rich soil with lots of organic matter and a pH of 6.5. Plant the largest cloves to grow the largest bulbs. Leave the outer skin on the bulbs, and do not separate the cloves from the bulb until you are ready to plant. Plant the cloves root end down, pointed end up, 6-8" apart. Cover with 2" of soil and a 6" layer of mulch (straw, hay, or grass clippings mixed with leaves). Do not remove mulch in the spring; it helps control weeds, preserves moisture, and provides nutrients as it decomposes. One or two foliar applications of fertilizer are beneficial before May 15. Do not fertilize after May 15 as this is detrimental. 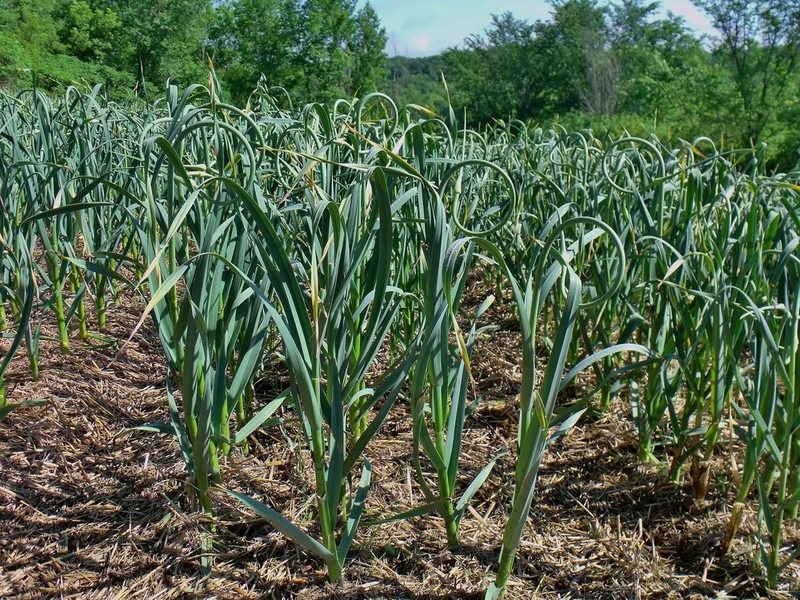 Garlic needs about 1" of water per week during the growing season. Cease all watering about June 1; this allows for better bulb formation and ease of harvest. Scapes are the curly center stems that often form as garlic matures. Cut or break them off after they are 10" long—they will inhibit bulb growth if allowed to remain. Garlic scapes are delicious in soups and stir fries, roasted, pickled, or turned into pesto. Harvest after leaf die-back begins and there are still five green leaves remaining on the plant—sometime in June or early July depending upon the year and your climate. Do not wait too long or the bulbs will begin to separate in the ground. Dig the garlic carefully, do not pull the stalk or it will separate from the bulb. Gently brush most of the dirt off—do not wash. Be careful not to bang the garlic bulbs against each other or a hard object. It will bruise. Remove from the sun immediately. ...and cut the stalks off about 1 1/2 inches above the bulb. At all stages handle your garlic carefully. It is alive! Bruise it, and it will not keep as long. Hold back your nicest bulbs for replanting again in the fall.